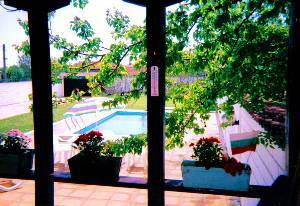 Varna, Varna North -Shabla, The property is four kilometres from the Black Sea and wonderful beaches and lake. The region of this property is known for its mild climate, nature reserves and ecologically clean production of fruits and vegetables. Shops and restaurants are close by [100-200 metres]. The town's population is 4.5 thousand. 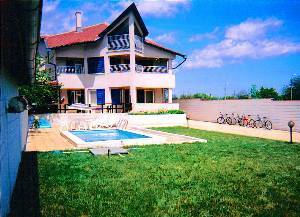 Property: Villa 5 Bedrooms, 3 Bathrooms, Sleeps 15. Large newly built detached Villa with outside pool, garden and night lighting surrounded by a large wall and gates and room for many cars. 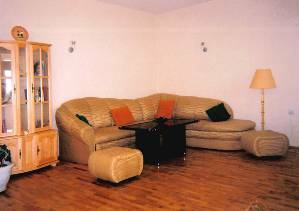 Situated on three floors it is separarted to three different apartments or used as one house. First two floors each have two furnished bedrooms, open plan living rooms with kitchen areas, modern bathrooms fully tiled with wc's and washing machines. All first floor rooms have balconies with wonderful living room balconies. The third floor represents a garret with balcony, three beds and wonderful view across the town - it is open plan with kitchen and bathroom. 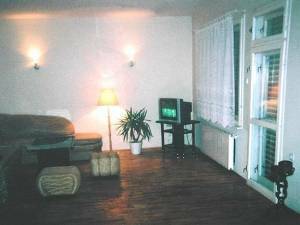 The property has two tv's and cd/radio players, two washing machines and six bicycles. It has also an outside kitchen and kitchen area for barbeque.